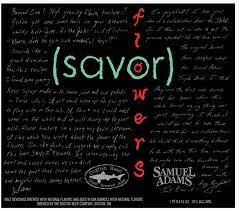 Partnership blooms between Sam Calagione of Dogfish Head and Jim Koch of Samuel Adams as they announce a new limited-edition collaboration brew: SAVOR Flowers. Craft beer innovators Sam Calagione and Jim Koch announced they are teaming up to brew the first-ever collaboration beer for SAVOR, the Brewers Association’s annual beer and food pairing event. Sam and Jim bonded over their admiration for each other’s beer rosters, as well as their enthusiasm to push the boundaries of brewing. Inspired by the concept of beer taking its rightful place at the dinner table, Sam and Jim are creating the brew, SAVOR Flowers, to be enjoyed by itself or paired with food. For ages, adventurous brewmasters have experimented with new varieties and processes surrounding three of beer’s four main ingredients—yeast, hops and barley—in an effort to create new and exciting brews. Jim and Sam decided to tackle beer’s previously untapped ingredient—water—and, through an age-old distillation process, created a rosewater base to be used as the main liquid in the brew. The rosewater inspired them to continue to explore the idea of brewing with flowers. After experimenting with a wide range of varieties, they landed on dried lavender, hibiscus, jasmine and rosebuds mixed in during the brewing process to further enhance the beer’s botanical qualities. As well, on his annual hop selection trip to Bavaria last year, Jim learned about a new hop breed known only as #369, grown for its amped-up floral notes. He was able to obtain 30 pounds of this unique variety from the Yakima, Wash. growing region, adding another dimension to this complex brew. SAVOR Flowers was aged in Barrel One—the same bourbon barrel Jim used to age the premier batch of the first “extreme” beer, Samuel Adams® Triple Bock, in 1993. Barrel One is the first barrel originally used for spirits which was then used to age beer. For the last 18 years it has been filled with Samuel Adams Triple Bock. Since starting out on this extreme beer journey, Jim has been committed to challenging American palates and introducing drinkers to brews that have carved out a new category in the craft beer world. SAVOR Flowers will be available exclusively to all attendees of SAVOR: An American Craft Beer & Food Experience, a food and beer pairing event held June 3-4, 2011 at the National Building Museum in Washington, D.C. Attendees will have a chance to sample the brew at the event as well as bring a 750mL bottle of the collaboration beer home with them. The story of Dogfish Head began in June of 1995 when they opened Dogfish Head Brewings & Eats, the first state’s first brewpub, opened in the resort beach community of Rehoboth Beach, Del. The company’s very first batch, Shelter Pale Ale, was brewed on a system which essentially were three little kegs with propane burners underneath. Brewing 12–gallon batches of beer for a whole restaurant proved to be more than a full time job. When the doors to the pub first opened, they brewed three times a day, five days a week! The one benefit to brewing on such a small system was the ability to try out a myriad of different recipes. The brewers quickly got bored brewing the same things over and over – that’s when they started adding all sorts of weird ingredients and getting kind of crazy with the beers! The reputation of Dogfish Head ales quickly grew beyond Delaware’s borders. Thanks to all the company’s employees and every one of their customers, Dogfish Head continues to grow today! The brand is now up to 34 distinct styles of beer that are sold in 27 states, and a half–dozen kinds of hand–crafted spirits… and they still have some ideas in the back of their collective heads. Now in its fourth year, SAVOR: An American Craft Beer & Food Experience returns to Washington, D.C. and expands from one to two nights. Presented by the Brewers Association (organizers of the Great American Beer Festival®), SAVOR, the benchmark of beer and food events, is a must-attend happening for beer lovers and foodies alike. Attendees will sample craft beers from 72 small and independent craft brewers who team up with a duo of expert chefs to pair each craft beer with delicious savory and sweet dishes. Educational salons and private tasting salons will provide additional opportunities for attendees to interact with some of America’s most talented craft brewers and chefs.